Stir frying thinly sliced bitter melon with meat and fermented black beans is arguably Chinese in origin but versions have sprouted all over Southeast Asia over the millenia. Some bitter melon and meat stir fries have ground meat, others have thinly sliced meat, beaten egg is added in some versions, some have chilies while others don't. In other words, while the basic recipe has remained the same, the variations are so numerous and, in some instances, a version is found in more than one cuisine. That makes it rather difficult to claim that one version is exclusively Vietnamese, for instance, when a very similar one is found in Cambodia. This recipe sticks to the basic bitter melon and black beans stir fry but integrates flavors and spices that are more Southeast Asian than Chinese. Fermented black beans are available fresh, canned or in pouches (canned and in pouches only outside Asia). Measure the amount you need and drain well before use. The liquid is much too salty and can ruin the cooked dish. Place the pork slices in a shallow bowl. Add the fish sauce, lime juice, sugar, and chopped chilies. Mix well making sure that all the ingredients are distributed evenly. Cover and leave in the fridge to marinate while preparing the bitter melon. Cut off the tips of the bitter melon and discard. Halve vertically and scoop out the seeds and pith. Slice the bitter melon into half rings about a quarter of an inch thick. If you want to minimize the bitterness, see the instructions. Heat the cooking oil in a wok or frying pan until wisps of smoke start to float on the surface. This is stir frying, the heat has to be extremely high and the oil needs to be very hot before any ingredient is added to it. 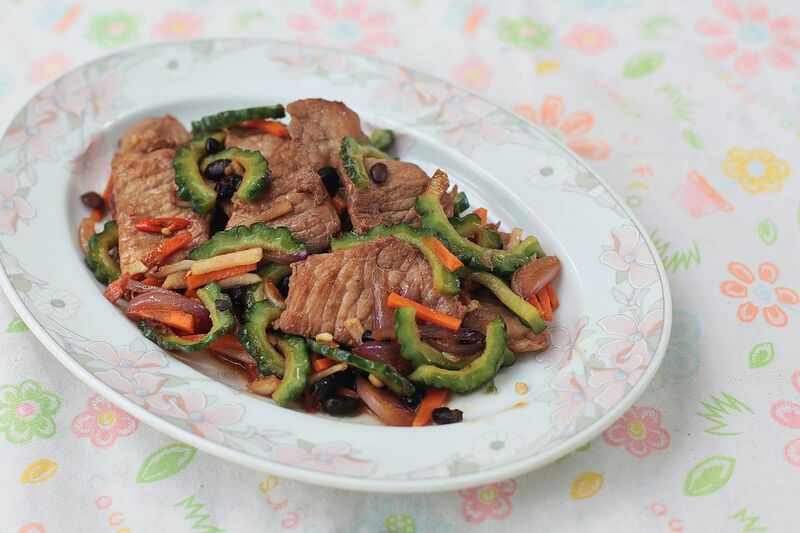 Dump the marinated pork into the pan and stir fry until the meat changes color. Add the bitter melon and the fermented black beans. Stir fry for another two minutes. Add the shallots, garlic and ginger. Continue cooking, tossing often, for about half a minute. Add the julienned radish and carrot, if using, and stir fry for another half a minute. Taste and adjust the seasonings, as needed, before serving.